On the day of the party, we picked up 2 cakes from the cutest little bakery in Georgetown called Deep Sea Sugar + Salt. Pam picked out the London Fog and the Carrot Cake, and both were SO SO good. If you’re in Seattle and want a killer slice of cake, make a stop there! As the party got started, the appetizers were set out, candles were lit, and plenty of champagne was poured. As guests arrived, everyone greeted each other warmly like old friends, and things got underway! Everyone mingled for a couple hours, and Carl and Judy each got to spend some time with each of their guests. You can tell they are the kind of people that truly care about how you’re doing, and want to hold a meaningful conversation with you. Two of the sweetest and most genuine people I’ve ever met. Towards the end of the evening after they blew out their candles, Pam surprised Carl and Judy with a video montage made by her family in Canada, and their reaction was priceless (cue many tears fro Judy!). It was the sweetest collection of photos from their whole lives together, and it meant the world to them to get to relive all those old memories! 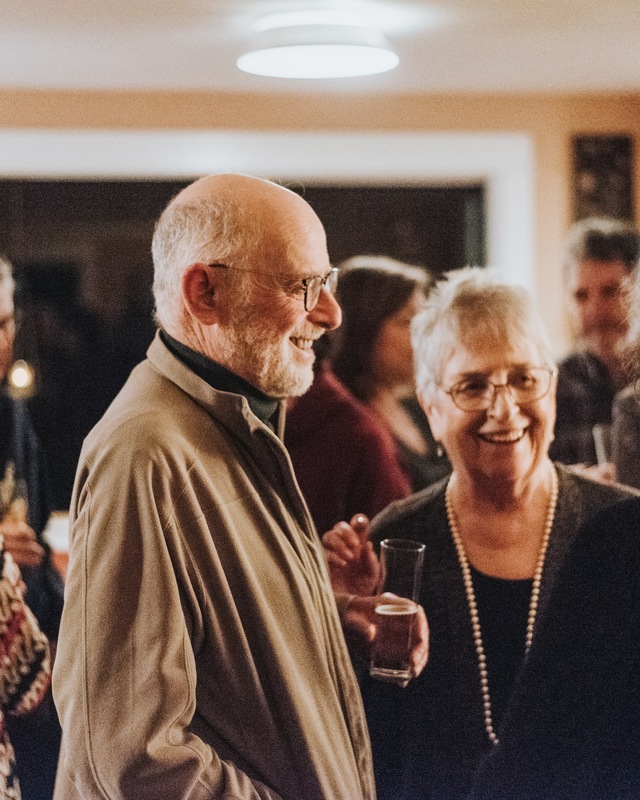 The energy in that room was so warm and appreciative and it was not hard to see how many people’s lives that Judy and Carl have impacted during their time together. Eventually, everyone said their goodbyes and made their way out. Carl and Judy read their birthday cards and watched their birthday video one more time before wrapping everything up. All in all, it was a sweet 3 hours of getting to observe all of these people coming together to celebrate these two, and they were definitely deserving of each and every minute of it!